c) Students who studied in Telugu Medium in 10th Class can also apply in English Medium Colleges. h) The age of the students shall not exceed 17 years as on 31.08.2019 and in case of students studied in Social Welfare Residential Schools and Social Welfare Hostels relaxation of 1 year will be given. 1. Selections will be made on SSC merit basis subject to fulfillment of ‘Eligibility’ and ’Reservation’. 1. Out of 87% [75% for SCs and 12% SC converted Christians], 60% of seats are reserved for the students who have studied in APSWR Institutions and SW Hostels, remaining 40% of seats are allotted for other SC students and SC Students studied in KGBVs and those who studied in any other recognized institutions. 2. The BC, ST, OC seats are reserved only to the students who studied in SWR institutions and SWR Hostels. Due to any circumstances, the seats are not filled with SWR Institutions / SW Hostels, the seats will be filled with the BC, ST, OC students, who have studied in any other recognized Institutions as per the merit. Where there is a tie, priority shall be given to the students of KGBV. 5. Up to 3% of the seats are to be earmarked for orphans / destitute in the age appropriate class in Residential Schools / Residential Jr. Colleges run by welfare departments and Education department as per G.O.Ms.No.47, Dated 31.08.2010 of women and Child welfare Department. 6. If no sufficient applications are received from outsiders, the vacancies will be filled in by students of TSWREIS and SW Hostel students. Candidates can submit the online applications through online mode @ http://cet.cgg.gov.in/SWInterApplication.do. OR Process for admission into:The applicant can submit his/her application to the Principals of Counseling centers in person (or) by post on or before 23-01-2019 by 5.00 pm. Sl. No. Name of the Region New District Covered under Region Counseling center for Boys Ph.No. Counseling center for Girls Ph.No. For all details visit www.tswreis.telangana.gov.in or contact any of the nearby TSWR School /Jr. College in the Region. 1. The candidates who applied for Intermediate admissions should attend the counseling on 07.06.2019 by 9:30 a.m. without fail at the counseling centers of their region. Boys should attend at Boys Center and Girls should be attend at Girls centers displayed for their region. 2. 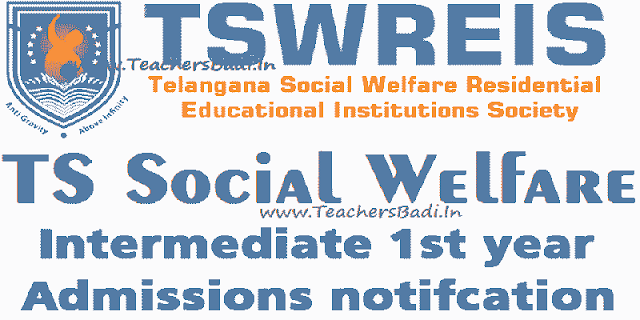 The TSWREI Society, Hyderabad will not collect any amount for On-line application (free of cost). 1. The Counseling process will start at 10:30 A.M. on 07.06.2019 and continue till last evening until the entire process is completed. All the candidates who have applied for admission into TSWR Institutions must personally attend counseling with the necessary original certificates. 2. Classes will be commences from 12.06.2019. 3. The Counseling will be conducted on ....2019 in the following centers. 4. Applications received after 5:00 P.M ...2019 either by post or in person will not be accepted. For more details visit www.tswreis.telangana.gov.in or http://tswreis.in/ contact any of the nearby TSWR School /Jr. College in the District. The Counseling process will start at 10:30 A.M. on 0..........2019 and continue till last evening until the entire process is completed. All the candidates who have applied for admission into TSWR Institutions must personally attend counseling with the necessary certificates. do u have phase 3 counsil.if it has let know the date. do u have phase 3 counsiling,if u have when can be it held.